Here is the much awaited Nougat 7.0 ROM for Galaxy Grand 2 CyanogenMod 14 (CM14). For latest updates, stay tuned to the Lineage OS device list page. This Nougat 7.0 has come for Galaxy Grand 2 via CyanogenMod 14 ROM. Since Google released Android Nougat Source code, we have update many Android NOUGAT AOSP ROMs and also many CyanogenMod 14 ROMs updated and many are yet to come. This Galaxy Grand 2 for CyanogenMod 14 is brought to you by developer AdityaUpreti. Earlier Aditya had brought the Galaxy Grand 2 AOSP Nougat ROM. Galaxy Grand 2 NOUGAT 7.0 AOSP ROM is also available. This is an initial build and you can try at your own risk. Make sure that you have a custom recovery installed on your Galaxy Grand 2. If not then download the recovery from above downloads section and you can follow this TWRP recovery installation on Samsung phone using ODIN guide. Download and Copy the GApps and Galaxy Grand 2 CyanogenMod 14 ROM ZIP to your phone. Reboot and Enjoy the CyanogenMod 14 Nougat ROM on Galaxy Grand 2. 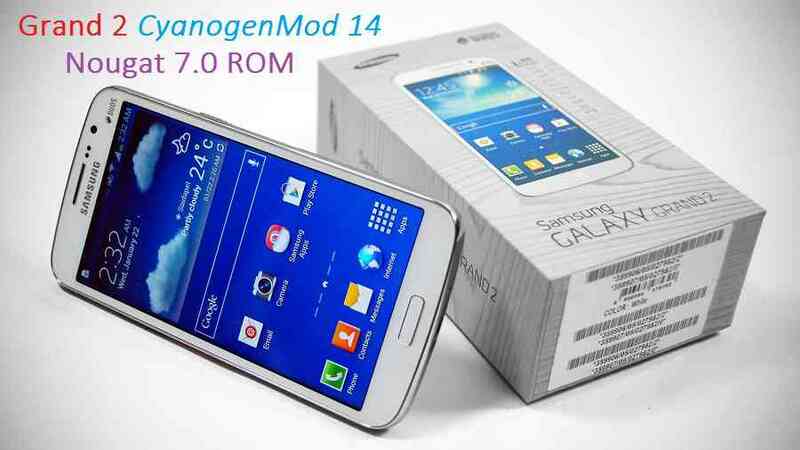 Copy the latest Galaxy Grand 2 CyanogenMod 14 ROM ZIP file to your phone. Stay tuned or Subscribe to the Grand 2 forum For other Android Nougat ROMs, CyanogenMod 14 ROMs, other ROMs and all other device specific topics. For the development link of Grand 2 CyanogenMOd 14 ROM go here. I installed it several times over each after perofrming a complete wipe, formatting /system /data /cache as well as dalvik, but I can’t seem to get past the boot animation. The blue head pops up and keeps ‘radiating;. It’s not frozen but rather stuck in a loop. FYI I’m shifting from aapav01’s marshmallow and for the time being will be returning to it. Any help is appreciated! The latest build has boot loop issue. Updated the download link accordingly. You can try the link and see it should boot.